When the Good Magician Humfrey’s son Hugo suddenly vanishes, his disappearance sets in motion a series of madcap misadventures that send a collection of colorful characters on a perilous pair of parallel quests. Among them are Debra, a pretty young girl beset by an obnoxious curse; Hugo’s beloved wife Wira, whose sightlessness is balanced by a talent for sensitivity, Happy and Fray, a pair of sprightly storm-spirits; Nimbus, the Demon Xanth’s own son; and the mysterious outlaw known as the Random Factor. As they travel through some of the magical realm’s most astonishing locales, these unwitting adventurers discover they are key players in a grand drama whose origins reach back to the origins of time itself. 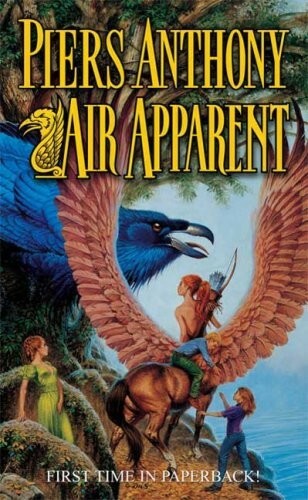 Filled with exhilaration and excitement, ribaldry and romance, Air Apparent is a fabulous new fantasy saga from the lively imagination of master storyteller Piers Anthony.